Come and experience the garden in full spring bloom this October. The wisteria is already blooming and the Secret Garden will be alive with day lillies and spring colour. Hot and cold drinks, cakes and light snacks available from the coffee coop. Plant Sales in the Secret Garden. Meet at the Plant Stand at 11am and 2pm for guided tours of the garden. Tree Elle Retreat is fully booked for the family and guests of Michael and Elouise as they join as husband and wife. We are delighted that Coby and Sarah have selected Tree Elle Retreat to share their special day with family and friends. The property will be closed for their exclusive use on this weekend. It will be a wonderful day when Chris and Hannah are married in the gardens of Tree Elle Retreat. 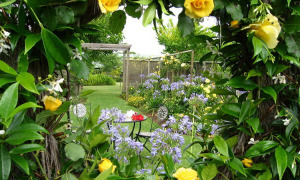 Their friends and family will enjoy the private use of the garden that many of them have watched grow over the years.